If a can of the right diameter can be found, put the FF in side the can for storage and use it for simmering. It could also be used to snuff out the stove when using a larger amount of fuel for consecutive burns at a later time. I'm going to start my search for such a can!!!!! you still selling these zelph? russb wrote: you still selling these zelph? Yes, still selling them. It's a great performer, very stable, fits Heineken pots irregular base like a glove. It's probably the most stable feeling potstand for the Heineken that i have felt with the exception of the Ring Of Fire that fits the ouside diameter of the pot. The Fancee Feest fits the inside dia. of it's bottom. DarenN wrote: the board has been too quiet the last couple days. i came up with an idea to make Zelph's F/F simmer. it works quite well. slide it down a bit for a little more heat. This is trully a great idea Daren. The concept of denying oxygen to reduce flame is good. I think it was used in the stove called Brasslite. I'm going to do some serious design with stainless steel and add it to the Fancee Feest be fore i relist it on ebay. It'l be included with the stove for simmering. Just today I was asked if the StarLyte can simmer. Had to say no because the stand now interfers with a cover being put over it. I thought of your idea and have been testing it to apply it to the StarLyte. Thanks again for the thought provoking idea. something i meant to mention but forgot. 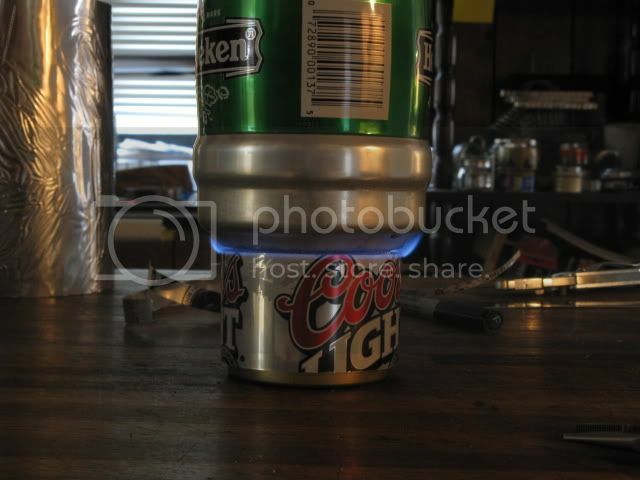 the cut open beercan simmering sleeve rolls up and stores in the inside of the burner. this also helps to keep it on a bit tighter curl so it holds onto the stove better. DarenN wrote: something i meant to mention but forgot. That's a good idea!!! How well is the edge of the aluminum going to hold up under the direct heat, ten burns or so and then flip it over or trim it off? zelph wrote: That's a good idea!!! How well is the edge of the aluminum going to hold up under the direct heat, ten burns or so and then flip it over or trim it off? just had a look at the one i've been messing with. maybe 6-8 burns at say 5 minutes each. the can/sleeve shows no evidence of anealling. actually, i'm a bit surprised at this. 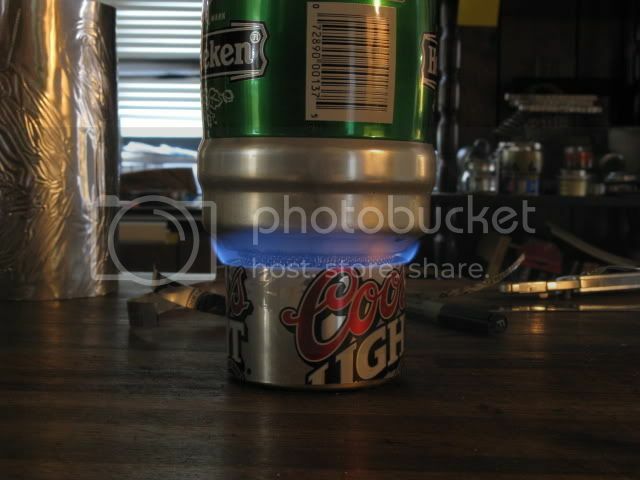 i've used a beercan sleeve on other burners (pepsi-g; photon; and such) for simmerring and they always burn up quicker than this. must be the brilliant design of the stove itself. it is my considered opinion the F/F is the best stove for the Heiny-pot. bar none. I think that anyone that has used the FF under a Heiny pot would agree with you. It feels really solid when you put the pot onto the stove. Doesn't want to move around at all. No wobble, nothin. The way it burns under the pot surprises me!!!! Just like you see in your photos, regulated burn rate, nice and even. I used a FF can to simmer with the StarLyte UltraLyte. It works geat. I'm amazed how it simmers. Things are just working out fine. Must be spring. we've discussed the concave bottom of the Heiny-can causing turbulance in the flame on some burners. i fixed it! i'll post pics in the pimp thread in a day or so.